PainTracker is an online assessment tool to help guide doctors to find the best treatment plan. People in chronic pain are some of the most difficult patients to treat. They have complex circumstances that medicine can’t always remedy. Pain can be amplified, by depression and anxiety, genetics and quality of life. Physicians are less prone to prescribe opioid medication to patients with long-term pain – but they need more treatment options. Clinicians and researchers at UW Medicine’s Center for Pain Relief found that an in-depth questionnaire can help immensely. Their work to create a pain assessment adaptable to any primary care clinic was recently published in the Journal of General Internal Medicine. 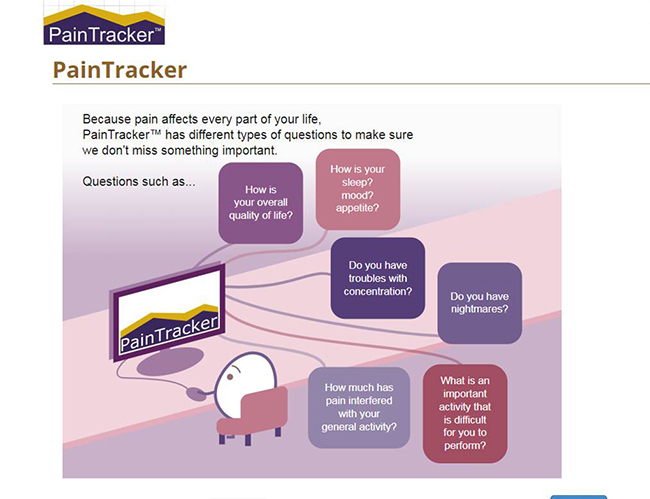 “PainTracker,” as they call it, is an assessment that can be filled out online from any digital device or completed on paper. “To effectively treat the patient, these questions should be asked,” said lead author Dale Langford, research assistant professor in anesthesiology and pain medicine at the University of Washington School of Medicine. She and co-authors estimated that 40 to 60 percent of patients with chronic pain have inadequate pain management. “This lack of progress may partly be due to the multidimensionality of chronic pain, which is not routinely incorporated into it assessment and management,” they wrote. The assessment addresses the patient’s treatment history, goals and expectations, pain intensity, pain-related disability, problems with pain medication, and quality-of-life issues such as sleep, depression and anxiety. A body diagram helps to pinpoint where the pain is affecting most. Before each follow-up appointment, patients complete a subset of questions that yields a visual graph showing areas of improvement. The graphs also help providers show how improvement in sleep, function, and mood often occurs before reduction in pain. “PainTracker provides a richer picture of patients’ responses to chronic pain treatments than the 0-10 pain rating scale,” said co-author Mark Sullivan, UW professor of psychiatry. David Tauben, chief of pain medicine at the UW School of Medicine, and a co-author of the paper, said the tool has “dramatically transformed” his ability to properly assess, treat, and manage chronic pain. He described the case of a patient new to his clinic who had already seen seven other doctors, including two pain specialists and had been prescribed a high dose of opioids and sedatives. The patient’s comments in PainTracker indicated severe depression, moderate anxiety, poor quality of life, sleep apnea, and likely post-traumatic stress disorder. At their first meeting, Tauben said, the patient embraced the responsibility to improve his mood, sleep and other ways to improve his life quality. The patient found relief with sleep-hygiene training, and resilience training from the center’s clinical psychologist. Under the center’s direction, he sought out functional rehabilitation sessions from a physical therapist. He took yoga classes at a studio and mindfulness classes led by one of the center’s physicians. A sample of primary-care providers (N=30) found an early version of PainTracker easy to use (70 percent) and thought that it helped patients to participate in their pain management (77 percent). PainTracker is not currently used outside of the UW Center for Pain Relief, but it incorporated more than 12 tests, which are freely available and described in the article. They include the Alcohol Use Disorders Identification Test (AUDIT), fibromyalgia symptoms (FS), Generalized Anxiety Disorder 7-item scale (GAD-7), Opioid Risk Tool (ORT), Snoring, tiredness, observation of stopped breathing (STOP), high blood pressure, and widespread pain index (WPI).